Are you currently going to effectively promote your business, but can’t decide what to start with? What you should know is that successful business development is unthinkable without reliable web presence. Having a small business website is an advantage in itself. It helps achieve several goals at a time. Regardless of the niche you specialize in, a website remains the top notch destination for clients and business partners, who are interested in dealing with you. Businesses that have online presence are more credible. Users consider it safer to deal with them as compared to those companies, which are not available on the web. Taking into account the 24/7 website accessibility, it becomes obvious that this factor may have notable impact upon the client base and its growth. Finally, a business website will help save your time and effort, eliminating the need to be present in the office all day long waiting for the potential clients to arrive. Instead, you will have enough time to make up your plans for the whole day, thus boosting your business promotion. That being said, we can conclude that having a website is crucial for any serious business. With multiple web building opportunities, it’s not easy to choose the best solution that will ideally work for your website development. Read on to find out the most effective web building options to choose the one you’ll further work with. As soon as you decide to run a small business website, you’ll come across various options. If you are ready to invest much into your website development, then you can hire a web design studio to do this work for you. However, that’s not the best idea, if you wish to be in charge of the web building process to further manage and update your website when needed. One of the best and the simplest DIY options is using a website builder. These services allow building different types of projects, which range in functionality, feature sets and result provided. Convenience and Ease of Use. Website builders come with a set of tools, which are easy to master even for newbies. This is because the systems are specially designed for users, who are not aware of programming skills and they also offer advanced functionality for proficient web designers. No Coding Skills Needed. You don’t have to learn coding basics as the web design process is intuitive and simple here. As a result, websites built with the systems are logically-structured and have decent designs. Business-Focused Features. Small business website builders come with lots of features specific for this very niche. They offer widgets, apps and extensions you can integrate into the project to boost its performance and avail decent result. Templates. The systems offer multiple business-specific templates to fit diverse spheres. They are usually mobile-optimized to be available on different devices for client convenience. Affordability. The prevailing amount of website builders have flexible pricing policy and offer different cost options to meet specific user needs and budgets. The choice of the plan generally depends upon the goal you plan to achieve and the range of business promotion services you need. 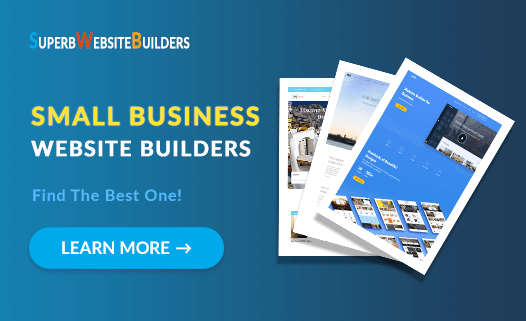 When it comes to the choice of the best small business website builder, most users feel somewhat puzzled just because they don’t know, which service will work best for them. Let’s review the major options and advantages of the most featured website builders so that you could know what to expect from each of them. Wix – is currently the most well-known all-in-one free website builder. The variety of templates, design customization tools, features and affordability have made it a decent tool to build different types of projects, including small business websites. The system is a great solution for entrepreneurs, who are not web design experts and don’t have time to learn the intricacies of the web building process. Whether you plan to launch a small-to-medium web store, connect a blog or a forum to your website or build a business site, you will find a suitable template here. All Wix themes are mobile-optimized and there is an opportunity to make use of the mobile editor to ensure nice mobile display quality. The changes you will make in the mobile version are not displayed in the desktop mode, while the edits made in the desktop website variant will be visible in the mobile version. If you are not a web design expert or just feel that you lack time to develop a website on your own, you can make use of the advanced Wix ADI tool. The feature allows building a website in the automatic mode. What you need is to provide the business info you wish to be available at your website and the system will take care of the rest. Another Wix advantage is email marketing feature. It allows creating stunning emails and sharing marketing campaigns in no time. Wix ShoutOut offers customizable styles, professional templates with ready-made layouts, easy contact integration. You can also make use of social media tools and stats tracker to check your website statistics. This is exactly what your business needs for effective promotion. Do you intend to launch a small-to-medium online store, but don’t have time to deal with specialized website builders? Then go ahead to explore Wix Stores – the feature that will let you launch an eCommerce website optimized for mobile viewing. Select the template, upload your web store info, contact details, products and their specifications, enable eCommerce features and set up payment/shipping options to run a web store that will come up to your needs and expectations. Wix also offers multilingual support, powerful blogging and social networking features. It allows connecting and managing a blog, which comes with a range of social networking tools. This feature makes it possible to interact with the target audience to find out their reviews and track the efficacy of business development. Due to the convenient and easy-to-use Wix SEO Wiz, you’ll be able to control the efficacy of your business website promotion. With this purpose, you can set up SEO parameters, track website statistics, integrate required tools and widgets and perform other actions to make sure your small business website obtains high ranks in Google. The cost of using the website builder is moderate. There are several plans you can choose from based on your web design skills and business expectations. The cost of the plans ranges from $4.50 and up to $24.50 per month and there is a free plan you can use to test the entire feature set of the service. This is convenient, simple and effective. See also: Complete Wix review. Shopify – is the top choice to launch a powerful eCommerce website. The website builder is a renowned eCommerce software, the feature set and tools of which are geared towards the design of all types of online stores. 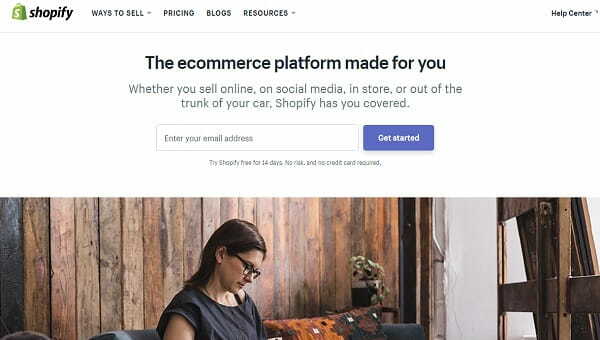 There are no eCommerce features Shopify lacks – take a look at the system’s features and tools to find out how much it has to offer. The website builder is a nice choice for beginners as well as for professional web masters, who specialize in eCommerce website development. Being a completely eCommerce platform, Shopify offers a broad range of flexible and powerful web design tools. Its Point-of-Sale or POS system makes it possible to sell products at your own retail storefront. The use of the external card terminal, offline order acception, automatic synchronization with Shopify account, ability to launch several user accounts, Quickbooks synchronization, report option – these are only a few advantages of this feature. • Cost – $9 to $299/mo. Shopify makes it possible to integrate a shopping cart and a “Buy” button to enable customers create the required amount of product cards. The system will automatically generate product embed codes to add the product lists and collections to the website. Integration of Shopify with Amazon Marketplace is done in a few simple clicks, while the result of this synchronization will exceed your expectations, if you plan to sell products on both platforms. Multichannel support will be of great help here as well. Among the other eCommerce features that make Shopify stand out from the crowd, it makes sense to mention availability of over 70 payment gateways, abandoned checkout recovery, Shopify App Store, multi language support, product reviews, customer profile access and more. They ensure positive online shopping process and decent result. Shopify is not a cheap website builder, but its feature set is worth the investment. The system has three plans, the cost of which ranges between $29 and $299 per month based of the features included. The 14-day free trial allows exploring the website builder to make the right decision on its further use. See also: Complete Shopify review. uKit is the best price-quality correlation in web-building niche. The platform has distinguished itself as a small business website builder and, thus, its entire feature set is focused on the completion of this task. uKit is extremely easy-to-use and it doesn’t require the awareness of coding skills. It is a nice solution for building websites for small company owners and private entrepreneurs, who are always pressed for time, lack web design knowledge and are not ready to invest much into website development. uKit template collection is one of the most impressive in the niche. It enlists hundreds of responsive templates divided into business categories for the ease of search. You can change the template on any stage of the web design process, while the content will be saved. Template customization process is also simple. Just access the dashboard to check out the tools you can use for this purpose. Being oriented on business promotion, uKit comes with amoCRM integration option. It simplifies the process of customer/order management. As to the business-specific feature, uKit abounds in them. Thus, uCalc cost calculator allows customers to find out the cost of products/services before they place an order. Business widgets like Timer and Timeline, for example, allow keeping control of the major order completion parameters (time and stages). uKit eCommerce features are worth separate attention. The website builder provides users with an opportunity to launch and then manage a small web store. Actually, you can go two ways here. You can either connect an eCommerce widget to your website and set up the parameters or integrate the Ecwid plugin to start selling online. As to the price aspect, the website builder is one of the most affordable solutions in the business web building niche. Its plans are cheap, while the range of features they offer is above the average. The cost of the cheapest plan constitutes $4/mo, while that of the most expensive option is $12/mo. Let’s face it – you won’t find cheaper rates for such an immense functionality! See also: Latest uKit review. SITE123 – is a free and functional cloud website builder, which offers a convenient WYSIWYG editor and makes it possible to develop versatile projects. The service is known for its simplicity, intuitive web building approach and convenience. It has much to offer to web design experts and it’s also quite understandable for beginners. This all-in-one website builder comes with a broad selection of responsive templates. They are versatile and free. They come up to multiple business spheres and can be effectively customized with regard to the niche you specialize in. If you cannot find a template you like, you can design a website from scratch. This doesn’t take effort and time as well. SITE123 offers multilingual support. As a result, you can create the required number of website language versions based on the target audience you plan to reach abroad. The website builder comes with a convenient and effective eCommerce module. Its use allows launching and managing powerful online stores with multiple options. You can manage product assortment, set up payment/shipping details, launch and update discount coupons, manage PayPal payment options etc. Small business websites created with SITE123 look appealing and are quite functional. The cost of using the service ranges from $10.80 and up to $28.80 per month. There is also a free plan, the features of which are enough to test the system before opting for a paid solution. The rates differ with regard to the functionality implied by the plans. See also: SITE123 complete review. Bookmark – is a cloud-based website builder, which comes with the Artificial Intelligence feature. The service is full-packed with business-specific options and allows building well-structured projects. Business websites and online stores launched with the platform have decent look and excellent performance. You can create a functional business website or an online store in a blink of an eye due to the advanced AIDA (Artificial Intelligence Design Assistant) tool. The entire process of website creation doesn’t take it longer than a couple of minutes, while the result will certainly impress everyone – so functional AIDA is! Just provide your business info and watch the way the assistant creates the website for you. Bookmark doesn’t have standard templates you can customize to fit your niche requirements. It is AIDA that offers a broad selection of free integrated themes, which differ in structure and are responsive by default. Select any of them to start working on your small business or eCommerce website. The platform supports over 50 languages, due to what you can create those website language versions you need to reach the target audience abroad. The website builder makes it possible to track your business website performance by means of using integrated statistics collection tools. There are also multiple mobile apps that allow for quick and effective website management from any location you are in. You can use Bookmark for free to launch a simple site. The cost of premium packages is quite affordable. To get a full-featured business or eCommerce website, you can choose one of twopaid subscriptions. Their cost ranges between $11.99 and $24.99 per month based on the terms and featured included. See also: Bookmark full review. The choice of a website builder that will meet your web design needs is quite responsible, but this fact doesn’t have to frustrate you. Prior to making the final choice, consider all the features the platforms mentioned in the article can offer you. Realization of your actual web building needs is the key to your success. Wix is a popular and free all-in-one website builder, which comes with the intuitive WYSIWYG editor and allows creating full-featured business websites. The service is known for its ADI tool, rich template collection and design customization tools. Shopify is a renowned eCommerce software. It allows creating small-to-large online stores with advanced performance and outstanding designs. The platform encompasses a long list of eCommerce features, the use of which will ensure the unsurpassed web store design experience. uKit is initially known as a small business website builder. It comes with excellent responsive templates and a set of business-focused features, which are needed to get decent result. SITE123 is a cloud website builder, which features exceptional ease of use and allows building business projects by providing multiple features and web design tools. Bookmark is a platform, the highlight of which is an advanced AIDA assistant that automatically creates a small business website for you by using the submitted information. Whether you want to take your existing business online or start earning on the web, the first step is to create your own website. Any of the above mentioned website builders will help you with this.